Shaun Derry experienced defeat in his first game in charge of Cambridge United as Oxford kept pace with League Two leaders Plymouth Argyle. Ryan Taylor's first-half goal, his fourth in three games for Oxford, came from Alex MacDonald's pull back. Danny Hylton hit the underside of the bar after the break after he rounded Cambridge goalkeeper Chris Dunn. Barry Corr had two late efforts from corners cleared off the line, but the visitors could not find a leveller. Former Notts County manager Derry, who was named successor to Richard Money at the Abbey Stadium on Thursday, saw his side create little before their late rally. 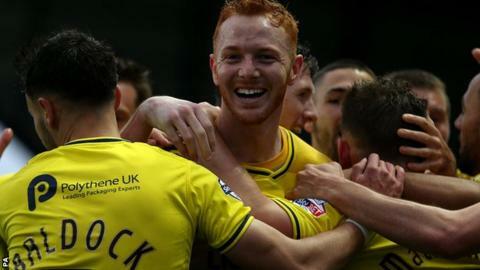 Oxford remain second in the table, five points behind leaders Plymouth, who beat York 2-1. "For the boys to keep a clean sheet today was crucial, especially after the blip we had in the last home game here against Barnet. "It was a little bit of a nervy end, which is obviously always the case if you only score the one goal and I said that to the players the importance of getting that second goal. "We created lots of chances on the day and you're always giving the opposition a chance to get something out of the game if you don't get it. "I thought the lads held firm, didn't panic, defended well when they needed to and were in the right places at the right time." "First game in charge against a really, really difficult opponent. Oxford I feel are a side that are going to get promoted. "I've watched a lot of this level lately and this team were a real stand-out team and it was difficult at times today. "But, I felt that we've shown a resolve that's probably been questioned in recent weeks and we found a way of affecting the game in the last 10 to 15 minutes. "There were parts of the performance where I think we can improve a lot on. But, in terms of the whole 90 minutes, we've come here and given Oxford a real game. "'I'm proud of the information the lads have taken on in the two days I've worked with them. But I want them to learn and go forward as a football club." Match ends, Oxford United 1, Cambridge United 0. Second Half ends, Oxford United 1, Cambridge United 0. Attempt missed. Luke Berry (Cambridge United) right footed shot from the centre of the box is too high. Hand ball by Ryan Taylor (Oxford United). Corner, Cambridge United. Conceded by Joe Skarz. Delay in match Alexander MacDonald (Oxford United) because of an injury. Attempt blocked. Barry Corr (Cambridge United) header from the centre of the box is blocked. Attempt saved. Barry Corr (Cambridge United) header from the centre of the box is saved in the centre of the goal. Corner, Cambridge United. Conceded by George Baldock. Corner, Cambridge United. Conceded by Ryan Taylor. Corner, Cambridge United. Conceded by Cheyenne Dunkley. Jordan Slew (Cambridge United) wins a free kick in the defensive half. Substitution, Cambridge United. Robbie Simpson replaces Mickey Demetriou. Jordan Slew (Cambridge United) is shown the yellow card for a bad foul. Alexander MacDonald (Oxford United) wins a free kick on the left wing. Foul by Jordan Slew (Cambridge United). Hand ball by Barry Corr (Cambridge United). Luke Berry (Cambridge United) is shown the yellow card for a bad foul. Liam Sercombe (Oxford United) wins a free kick in the attacking half. Corner, Oxford United. Conceded by Leon Legge. Substitution, Cambridge United. Jeff Hughes replaces Conor Newton. Corner, Cambridge United. Conceded by John Lundstram. Attempt saved. Kemar Roofe (Oxford United) header from the left side of the box is saved in the centre of the goal. Alexander MacDonald (Oxford United) wins a free kick on the right wing. Foul by Ryan Donaldson (Cambridge United). Corner, Oxford United. Conceded by Harrison Dunk. Attempt blocked. Kemar Roofe (Oxford United) right footed shot from outside the box is blocked. Hand ball by Alexander MacDonald (Oxford United). John Lundstram (Oxford United) is shown the yellow card for a bad foul. Jordan Slew (Cambridge United) wins a free kick in the attacking half. Substitution, Cambridge United. Jordan Slew replaces Rory Gaffney.